I love seeing those little leopard points poking their heads out! 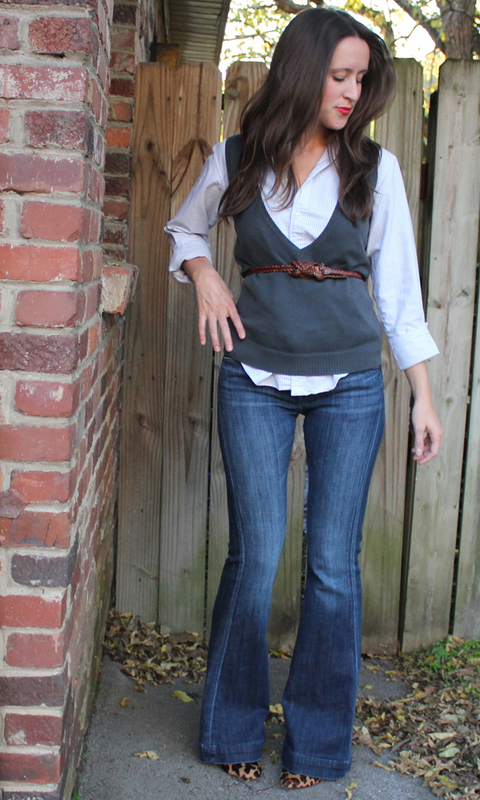 Men's style layers on top with fit and flare jeans & hot mamma heels on bottom is my JAM! Do you have a favorite odd couple pairing? Delicate lace with goth studs? Tough leather with girlie pleats? 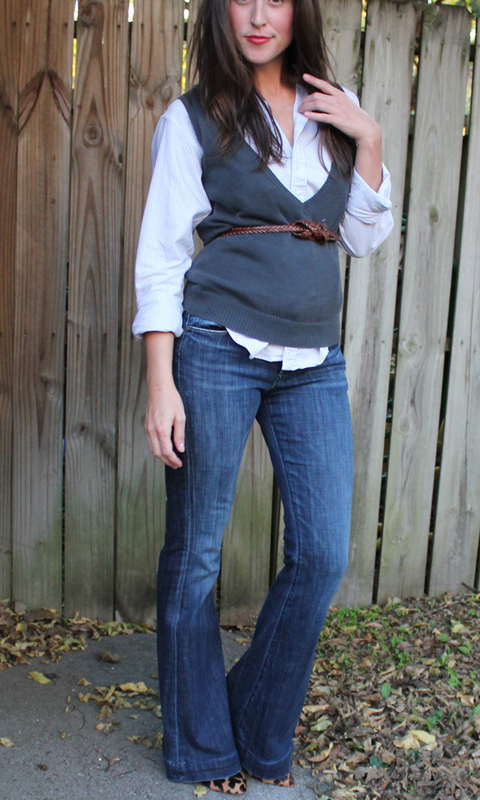 School boy blazer with feminine scalloped shorts? I love that vest belted! and those jeans look so good on you!!! Love the menswear inspired look with the hint of leopard! I love this layered look, Jessica! 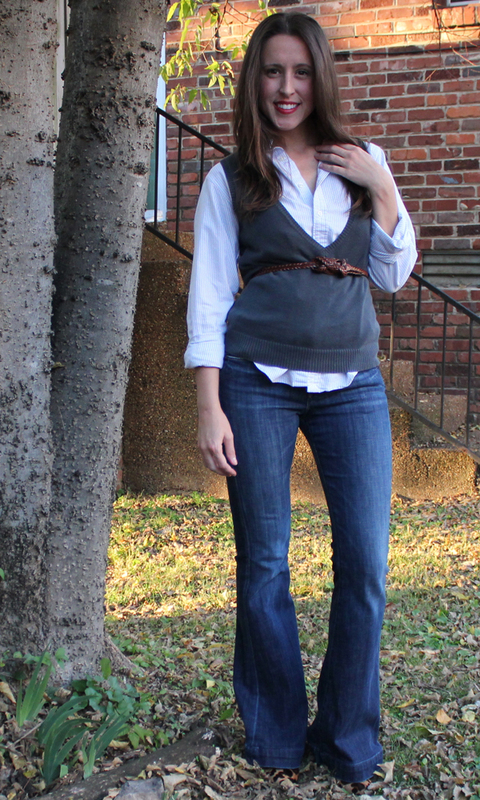 The vest and collared shirt are darling together. 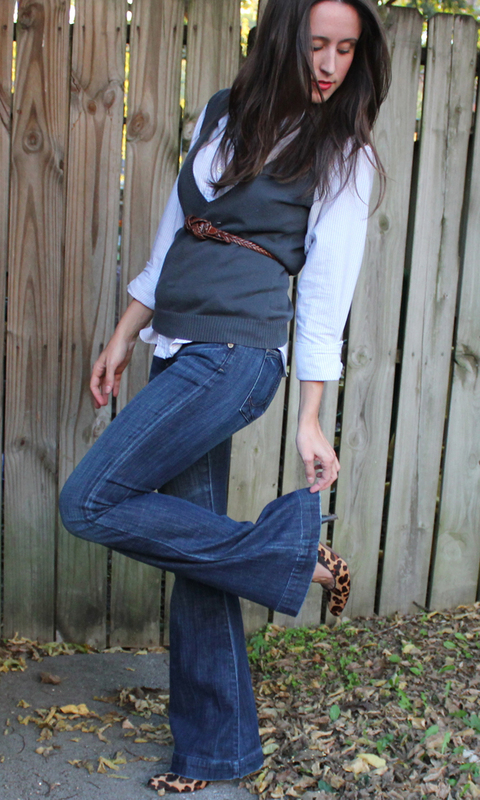 And the leopard print shoes poking out under your jeans is such a fun touch. Sometimes unexpected pairing are the best! What a great combo~ you look beautiful, love the hint of leopard! I absolutely love those jeans! Those jeans look fabulous on you! Your legs look so long, and I love the leopard peeking through! This is so cute! I love that vest belted! Great outfit! I LOVE your jeans! They fit you like a glove! Cute look! 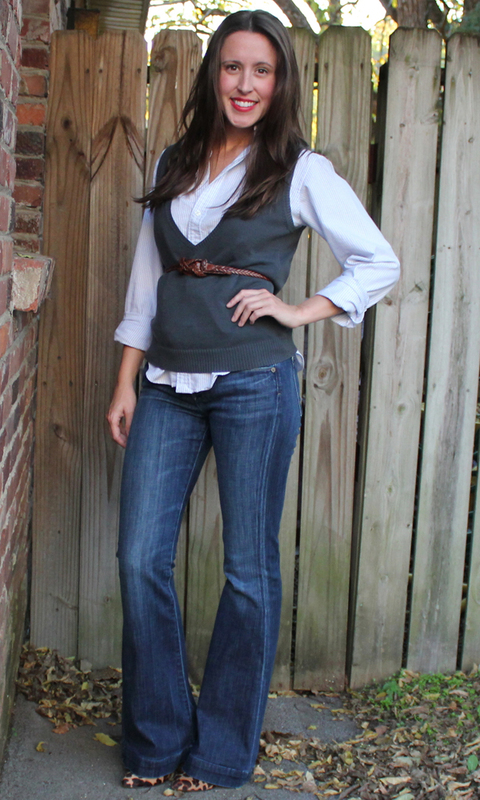 Loving your vest and jeans! I love your shoes!! And I really love pairing leather with girly pieces. Thank you dear! 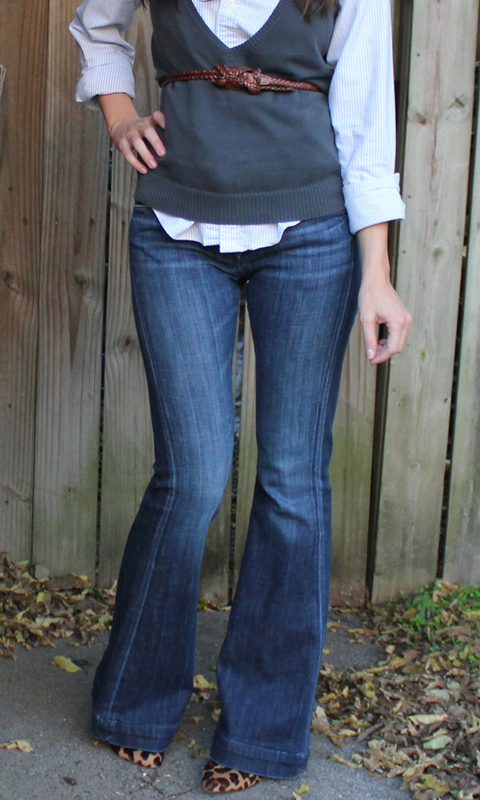 That is the beauty of flare leg jeans! Ooh I love that pairing too! Going to go check out your look! Thank you pretty lady, you are too sweet! LOVE THIS OUTFIT, JESSICA. might be my fave of yours EVER!! you look amazing!! i totally wanna recreate it!! I love mixing masculine looks with some feminine touches! Those shoes are sweet :) I also really like how you tied your belt!! Or did it come that way? Either way it's really neat! Love this outfit! 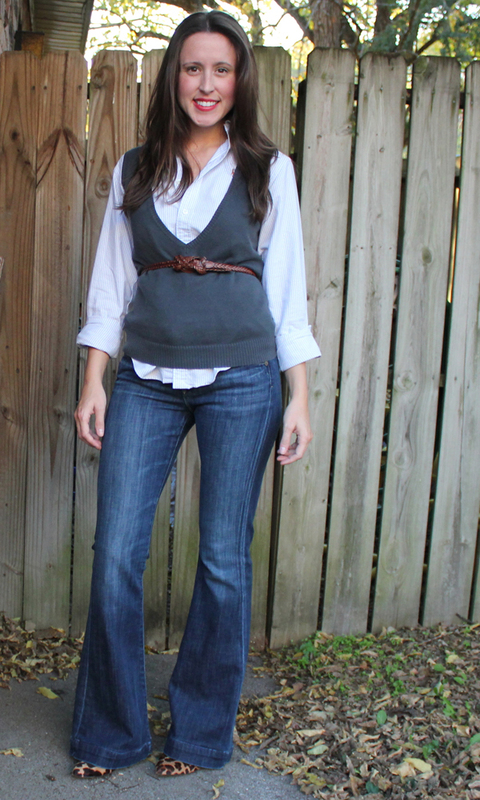 I've been looking for a nice slim sweater vest for a while but seriously cannot.find.anything!! I've found sweater vests at Lands End, but they tend to be fairly chunky--I like the deep V on yours. Any suggestions?